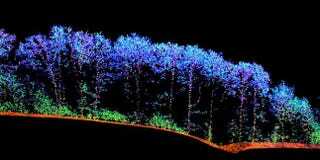 It looks like a work of art, but the image shown above is the 3D structure of an actual forest, reconstructed from sophisticated laser scans that scientists now hope can be used to quickly check a forest’s vital signs. Kinda like a tricorder IRL. A research team based in Hungary and Vienna is fine-tuning an aerial laser scanning technique known as LIDAR to monitor the health and biodiversity of protected natural areas across Europe. The principle here is quite simple. During an aerial fly-over, a short pulse of infrared radiation is sent from a laser system to the ground. An echo of that pulse is scattered back and captured by a sensor, which uses the degree of scatter to reconstruct the shape of the landscape below. Unlike aerial photography, laser scanning can be used to model the entire structure of a forest down to the ground. The researchers are now feeding this data into software they wrote in Python, which uses complex algorithms and machine learning to identify different assemblages of plants that typically occur together, including trees, shrubs, herbs and grasses. Unwelcome disruptions, such as weeds and vehicle track marks—maybe even your litter—can also be detected. A healthy woodland will harbor a diverse mix of woody and herbaceous plants, but prior to this technology, forest “check-ups” could only be conducted through slow and laborious field expeditions. In a proof-of-concept demonstration, the research team showed that they were able to achieve up to 90% agreement between remotely collected data and on-site observations for a protected mosaic of marshes and meadows in Hungary. Hopefully, the new tool will aid in ecosystem monitoring and conservation, allowing researchers to keep a keen eye on vast swaths of protected land, and to catch early warning signals when something looks amiss. That’s good news, because we’re already seeing all sorts of shifts in the composition and productivity of natural ecosystems thanks to climate change. When it comes to adapting our management strategies, the guys protecting our forests need all the help they can get. Read the full open-access scientific paper here.